Where does the time go? I've managed to keep up with the weekly topics, but other than that I haven't done much posting. I was out of town for several days a couple weeks ago, as I attended teachers convention. I would have rather stayed home and worked in my classroom, but we all went, and had a fun time. Look at the snazzy dessert they served at the keynote luncheon. 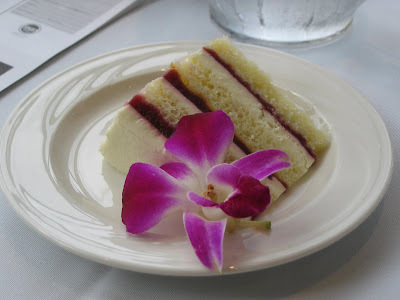 The desserts were at our places when we got there, and the tables looked just beautiful!! I was surprised at the delicious meal they served us. Very nice! I finished my bag for my Fall Felted Bag Exchange Pal and put it in the mail today. The picture isn't very flattering.... it actually looks quite cute in "real life"!! I ended up making my own buttons out of polymer clay, which was fun. I took a close-up pic of them, but it turned out blurry. My pal said she likes bags that are embellished, so I took her at her word and went for it. Sure hope she likes it! And, I found out about a CONTEST!! Pop on over to the Knittin Coop and wish her a happy 2nd blogiversary! She wants to meet more bloggers, so leave a comment, and be sure to tell her I sent you! I seem to have lost my knitting mojo, with the exception of dishcloths. I've got so many projects I want to start, but I can't seem to get any of them rolling. I just keep saying to myself, "Well, maybe I'll make another dishcloth". I do believe I'm stuck in a rut. I'm headed to Minneapolis later this week, so I really want something fun to work on during the trip, as that's about 5-1/2 hours of knitting time each way. My dad, who lives in Arizona, lost his wife on Friday. She's from the twin cities, so the funeral will be there. She's lingered for quite some time, suffering with Alzheimers. My dad told me that watching her deteriorate like that is the hardest thing he's ever been through in his life, including his experiences in Germany during WWII. I know I talked about my mom's problems with her mobility in an earlier post, and now it's been decided that she'll have a total knee replacement on November 12. I really dread that, as she's had a knee and a hip done before, and she doesn't do well with those surgerys. With the hip she was in the hospital for 21 days, and we thought we were going to lose her. So, I'm in a whirlwind trying to get ahead of the game and be ready to be gone from school both during this week, and then again the week of Nov. 12. I must say I'm feeling overwhelmed. 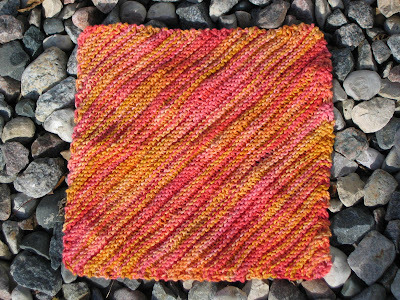 On a lighter note, I do have a picture of one of my finished dishrags! It's the first time I've used this pattern, and I really like it. Have already made another one, in fact. I recently ordered a few more patterns from Harvest Moon Designs, and this is one of them. Their patterns are so well written and easy to follow. If you've never checked out their site, you should. Lots of great dishrag eye candy!! Isn't the yarn gorgeous? It looks good enough to eat! It's a hand dyed that I bought on ebay some time ago, and now I wish I'd gotten more. 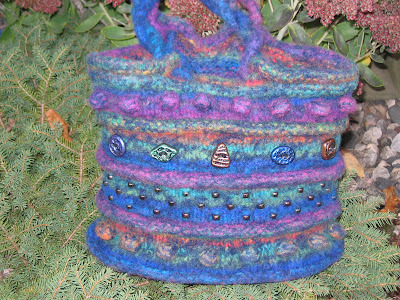 Beautiful felted bag...Thanks for entering my contest, glad you checked out my blog! Very sorry for your father's loss. I had to watch three great aunts deteriorate with Alzheimer's, and it's just awful. The bag and cloth are great though!! I'm very sorry for the loss of your Stepmother. So tragic - thoughts & prayers to your family! sorry for your family's loss and about your mom's upcoming surgery. Your knitting looks beautiful love both the bag and the cloth. I live in an apartment and have no washer or dryer for felting so I am always intrigued by it! I'll be praying for your family! So sorry about your Fathers loss..I've delt with that myself, how I lost my mom at age 56..yeah, it hits young ones to. Your pal will love the bag you made, I know I do..its beautiful!!! Best wishes to you and hope you can get back into the spring of things soon! The bag is as cute as Alana says it is! Actually it is absolutely gorgeous. I should know, I'm the lucky recipient! You did a beautiful job!